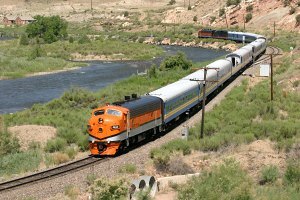 The Canon City & Royal Gorge operates the most scenic parts of the former D&RGW Royal Gorge Route - a 12 mile piece of track from Canon City, CO, to Parkdale. The route passes along the bottom of the Royal Gorge, a 1,053 foot deep chasm carved through the rock by the Arkansas River. The line was purchased in 1998 jointly by both the CCRG and Rock and Rail?, which provided freight service from the Parkdale gravel quarry. The CC&RG operates a variety of different trains on the line - the regular sightseeing runs as well as gourmet lunch and dinner trains. For those interested in riding, please visit the Royal Gorge Route official website.